* Xilinx XC3S200AVQ100 Spartan 3A FPGA with 200kgates, 16 Multipliers and 288kb RAM. * 4 x Digilent-compatible I/O ports with 8 FPGA I/O, VDD (selectable 5V or 3.3V) and GND. * 3.3V I2C port for off-board serial expansion. * JTAG port for FPGA development and debugging. The impetus for this board is to experiment with FPGA-based audio synthesis algorithms, Software-Defined Radio and miscellaneous interfacing. Adding an FPGA to a powerful embedded processor can augment it's capabilities by enhancing real-time responsiveness, adding flexible I/O and creating customized smart peripherals. All GPIO/Muxed signals on the Beagle Expansion connector are routed to the FPGA, with the exception of the I2C signals which are used for ID and control on-board. Configuration of the FPGA uses SPI port 4, so your kernel will have to support this and alternate functions for these pins are probably not practical without some serious kernel code changes. That shouldn't be a big issue though, because the FPGA bitstream can use SPI port 4 for control, or route it through to the I/O connectors after configuration. All other GPIO pins connect without restriction, aside from direction controls which must be setup via I2C for GPIO_130-GPIO_132 and GPIO_157. The 1.8V, Reset and Regen pins are not used. 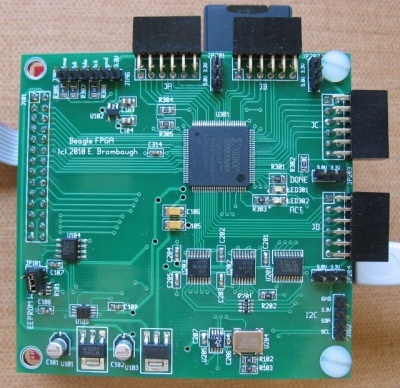 This board has no on-board flash for the configuration of the FPGA - the configuration is written to the FPGA by the Beagle board via SPI port 4. This allows the board to be re-configured at any time merely by restarting the configuration and downloading a new bitstream from the Beagle. A PCF8754 I2C port expander controls the configuration process and also provides direction control for some signals that had to be level shifted. The port expander is at I2C address 0x38. A bitstream download application which uses kernel I2C and SPIDEV drivers to manage the process is be provided for userland setup. The current version (v0.3) runs the SPI port at 10Mbps and configures the FPGA in less than 1s. After configuration these interfaces can also be used to control the FPGA. A 3.3V level shifted version of the Beagle I2C2 bus is available, along with 3.3V supply and GND on a 4-pin header. This can be used to add I2C peripherals off-board. Bear in mind that there already 3 devices (ID EEPROM, Port Expander and Clock Oscillator) on the bus, so check that any additional devices don't collide with those already on the bus. These are 12-pin right-angle 0.1" receptacles which conform to the Digilent PMOD standard. Each connector provides 8 bits of direct connection to the FPGA, along with two power and two ground connections. Power is jumper selectable as either 3.3V or 5V on a per-connector basis. Digilent (and others) sell a variety of I/O boards for this standard that are inexpensive, small and provide a wide range of interfacing opportunities, including Ethernet, RF/Wireless, motor control, audio, etc. Find out more at Digilent's site. There are two of these connectors on two sides of the board, spaced at the same interval as is found on Digilent FPGA boards, so standard two-connector boards with up to 16 I/O signals are possible. The Xilinx XC3S200A Spartan 3A FPGA on this board is inexpensive (about $10 in single quantity) and provides sufficient I/O and logic resources to perform a wide range of interfacing and processing tasks. Simple signal processing, sequencing and control are certainly possible, as well as some buffering and reformatting using on-chip RAM. Two LEDs are on-board. A blue one labled "DONE" lights when the FPGA has a valid configuration. A green one labled "ACT" is connected to an I/O pin on the FPGA and can be used as a visual annunciator of internal activity. No dedicated clocks are provided on the Beagle expansion header, so this board provides two clock sources. A crystal oscillator generates a stable 50MHz clock suitable for high-accuracy timing, while an I2C-programmable oscillator supplies a variable clock in the 1kHz to 68MHz range with less accuracy and more jitter. This device is at I2C address 0x17. On-board 3.3V, 1.8V and 1.2V LDO regulators derive all the supplies required from the Beagle 5V supply provided on the expansion connector. While the 3.3V and 1.2V regulators which supply the FPGA I/O and Core voltages are rated for close to 1A, it is recommended that FPGA designs which require high power are not considered for this board. Although the Spartan 3A chip used here can operate at fairly high internal frequencies approaching 200MHz, the practical limitations of power supply and heat management will constrain the designs that can safely be realized on this board. There are some minor hardware dependencies due to changes in the Beagle schematic over time. Prior to revision Beagle rev C2, expansion port pins 4, 6 and 10 were connected to GPIO140-142. From revision C2 onwards these pins are connected to GPIO144-146. Unfortunately, due to the way u-boot currently detects expansion boards and Beagle revisions, it is necessary to modify the pin mux code in u-boot to account for this difference and make these pins available for GPIO. A patch will be provided to handle this case. Minimal kernel driver support required for the Tracker includes I2C2 and SPI port 4 with SPIDEV, as well as pin muxing to make these interfaces available on the Beagle expansion port. Since the Tracker conforms to the Beagle IDPROM standard it is already automatically recognized by recent versions of u-boot and pin-muxes are correctly set. Kernel patches to enable I2C2 and SPI4 may be required however - find out more about how to do this at emeb's Beagle page. A complete patch against the Angstrom stable 2.6.29 kernel is here: bfpga.patch. A patch against the Angstrom unstable 2.6.32 kernel is here: 0045-ARM-OMAP-beagle-add-support-for-beagleFPGA-expansion.patch Note that this patch relies on the new kernel command argument 'buddy=beaglefpga' being passed in from u-boot in order to enable the SPI4 port. I2C2 appears to already be enabled, so that's not needed as it was in the .29 patch. A "Manufacturing Test" program is also available which exercises all the expansion port pins between the Beagle and the FPGA, as well as the Digilent output ports and the on-board clock oscillators. The program can be used as an example of accessing GPIO, controlling the level shifter directions and talking to the FPGA's designed-in SPI control port. Note that this requires some boot loader hacking to make Beagle GPIO pins 144-146 available via SYSFS. See above under boot loader for more details. Synthesizing an FPGA design requires the Xilinx ISE Webpack which is a free download from the Xilinx website. This suite of tools includes a GUI IDE as well as command-line applications that can be run under both Linux and WinXX. Designs can be created with either Verilog or VHDL. Demo designs will be provided to showcase the capabilities of the Tracker board and will provide enough detail for starting on custom designs. * 04-04-10 - SPI Loopback works. * 04-06-10 - Start Schematic. * 04-07-10 - Start Layout. * 04-09-10 - Preliminary Layout Complete. * 04-12-10 - Revised Layout for proper footprints and backside connector. * 04-14-10 - Cleanups, fix exp. connector location to match. * 05-12-10 - Bitstream download from Beagle works - app source posted. * 05-13-10 - Tested SPI loopback, added Prog Osc ctl, revised app source posted. * 05-14-10 - FPGA SPI control port works, git repo updated to V0.3. This page was last edited on 1 January 2014, at 21:20.